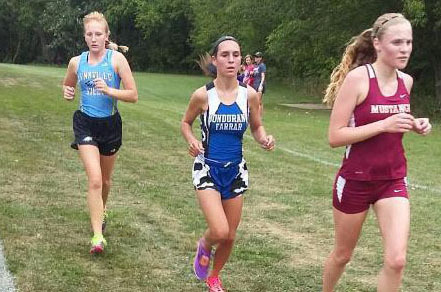 After three weeks of practice, L-S cross-country runners started their competitive season at Williamsburg on Tuesday, Aug. 29, and finished the week at Pella on Saturday. In Williamsburg, the Hawks went up against mostly 2A and 3A schools; however, they also faced a couple conference schools. Both BGM and last year’s conference champions, Belle Plaine, finished behind the Hawks, who took seventh out of nine. Lynnville-Sully newcomer Mary Kate Shaver, a senior, was the first to cross the finish line for the Hawks. Her time was 22:19, which placed her 12th. “Mary Kate had a strong Lynnville-Sully debut and really looks poised to have a strong season,” commented L-S Coach Darin Arkema on Shaver’s first performance of the season. Sophomore Abby Gruver came in second for the Hawks, clocking in at 24:07, placing her 24th. Fifteen seconds behind Gruver was freshman Megan Van Zante (28th). “Megan ran a lot during the summer to get ready for her freshman season, and it showed tonight and will pay off all season for her,” said Arkema. At 25:08 came senior Christine Nikkel (35th), followed by junior Emily Van Gorp (44th), 27:01, senior Haley Breeden (48th), 27:36, and senior Hailey Scandridge (51st), 28:49. Other competitors for L-S who ran the JV girls race were sophomore Ashton Thompson (10th, 26:08), freshman Hadley Tice (19th, 27:51), junior Berta Ciruelos (20th, 27:53), and sophomore Brittney Hansen (21st, 28:16). The L-S boys, unable to form a complete team, had three runners on Tuesday. Senior Josh Dunsbergen finished 32nd in 19:43. Junior Joseph Anderson finished 10 places behind Dunsbergen, clocking in at 21:21. Freshman Mason Jansen ran his first ever cross-country race in 22:00, earning 47th. The girls team got third in the small school division, and everybody improved their time from Tuesday’s race. “We had a great opportunity to test ourselves against a great 2A team in Mid-Prairie and a ranked 1A opponent in Baxter,” added Arkema. Shaver finished first for the Hawks, running a 21:27. This put her in eighth in the small school individual standings. Van Zante followed, earning a 23:06 and placing 15th. Gruver was one place behind her at 23:16. Breeden ran a 25:15 and placed 27th. Not far behind was Thompson at 25:47 and Van Gorp at 26:13. Some other runners for L-S included Hansen (27:09, 36th), Tice (27:15, 37th), Scandridge (27:21, 38th), and sophomore Abigail Davis (27:29, 39th). Only two runners for the boys team were able to compete on Saturday. Dunsbergen ran a 21:25, placing him 28th. Jansen placed 39th after running a 22:00. The team placed to race in Grinnell on Tuesday, Sept. 5. Then on Thursday, Sept. 7, they make the journey to Pleasantville. On Thursday, Sept. 14, the L-S cross-country team will host its annual meet at the Diamond Trail Golf Club in Lynnville. There is a need for more assistance, so any community member who would be willing to help with traffic and parking or out on the course somewhere is encouraged to contact either L-S Coach Arkema or L-S Athletic Director Bob Scandridge at the school. Coach Arkema and the team also want to invite community members to come out as spectators and fans to cheer for the Hawk runners. Arkema’s contact info is arkema@lshawks.com or 594-4445, ext. 105. AD Scandridge can be reached via email at scandridge@lshawks.com or call 594-4445, ext. 137.